Welcome to our monthly thrift store upcycle blog hop! 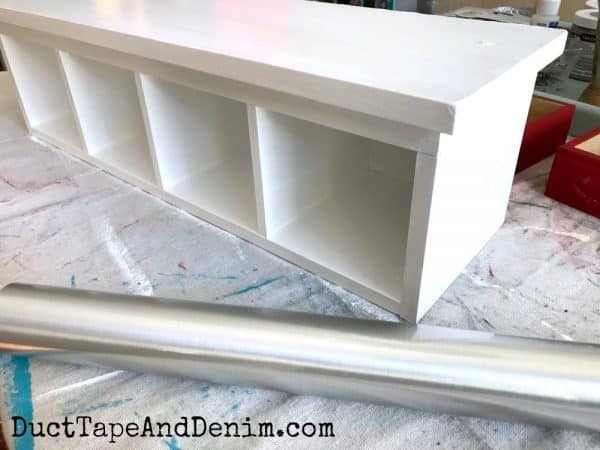 This month’s thrift store makeover started with this simple shelf that I almost didn’t buy. I needed a small kitchen shelf and this one was the perfect size but I wasn’t too excited about it being MDF instead of solid wood. I was concerned that it wouldn’t hold up to use in my kitchen. But I bought it anyway. It was cheap… around $3. And I had a plan to try something new! This was a pretty basic makeover. The most important part was cleaning! I just used a regular spray cleaner to make sure all the dust and gunk was off the kitchen shelf. Then I gave it a couple of coats of satin enamel paint. This is the same paint I used on my bathroom cabinets and a couple of jewelry cabinet makeovers. 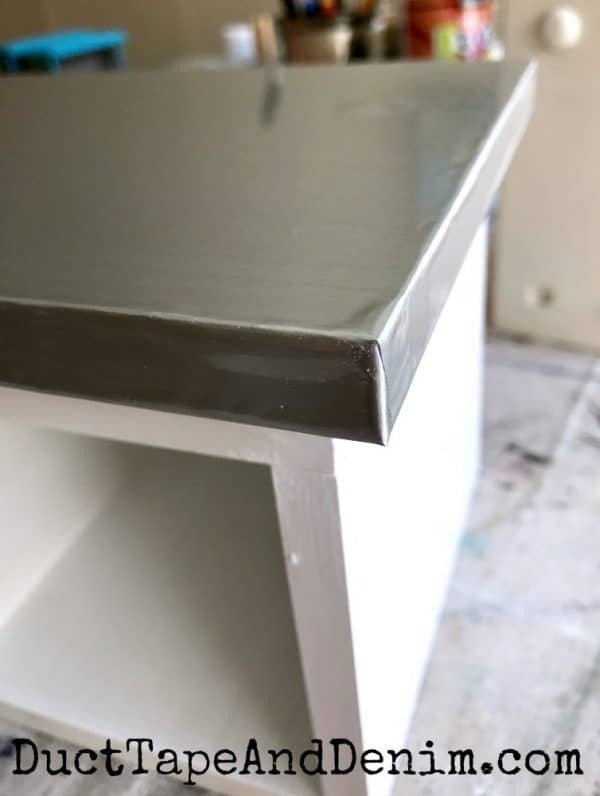 It has a hard finish when it dries and doesn’t need a top coat. But since I knew I’d be sitting things on top of this shelf I wanted an even tougher finish. So I ordered some faux stainless steel Con-Tact paper on Amazon. This paper has grid marks on the back so it was easy to cut it straight. I first turned the shelf upside down on top of the back of the paper and marked enough to wrap around the sides. Think “Christmas present wrapping” when you do the corners! I’ve been really happy with the result. This kitchen shelf gives me just a little extra storage in my small kitchen. Now check out all the other upcycled projects for this month. We share at these blog parties. Featured on Meet up Monday. This turned out really cute. I have never heard of that contact paper before. I need to check that out. 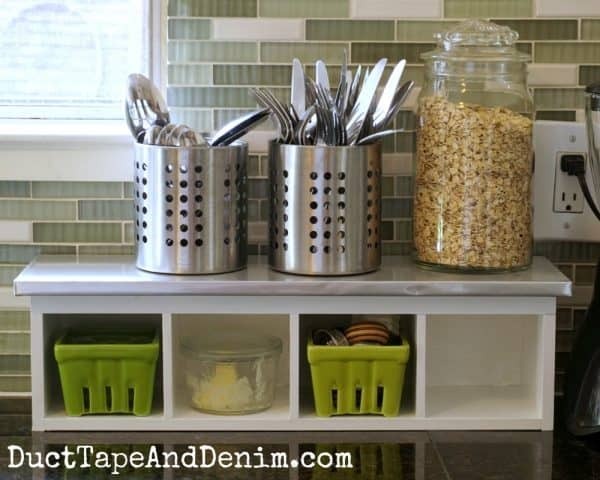 I love all of the pops of green and I really love that backsplash! This shelf looks fantastic and any extra storage is always good. The contact paper looks amazing. Love your backsplash. That stainless look contact paper just set it off! I didn’t even realize that existed. Now I’m going to walk around my house and see what I can cover with it! 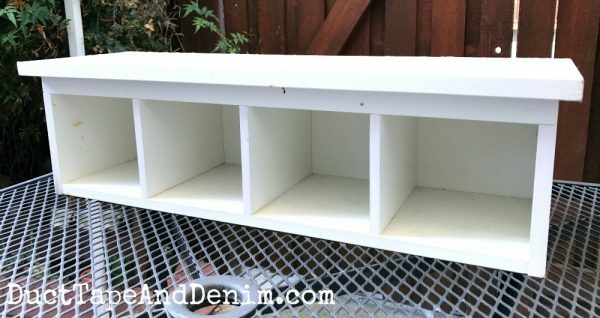 Thrift Upcycle is my favorite time of the month in blog land! One can always use more storage on the kitchen counter. The vinyl looks legit like stainless steel. Visiting from Thrift Store Challenge. That’s cute Ann. Love it! Wow! This is such a great update! I love it! Not only is this handy but it is so cute. The stainless steel look contact paper is a great idea. It looks great. I’ve considered getting that paper or something like it to cover our black dishwasher to make it match our other stainless appliances haven’t had the nerve to try it yet! Try it! I have a friend who did that to her old dishwasher and she loves it. I had no idea there was faux metal contact paper. It looks like the real thing! Where can I put some???? Thanks for sharing! I love it!!! What a cool idea you had, using that faux metal foil. I’ll be thinking about where I could give that material a try as I really like how it looks on your little shelf. Love it! I am currently obsessed with the faux copper contact paper. I still need to try copper. How did you use it? Such beautiful on the counter storage! Love it! I’ll be on the hunt for that contact paper this weekend! I would never guess that was wrapping paper!! It looks great. What a fun little project! 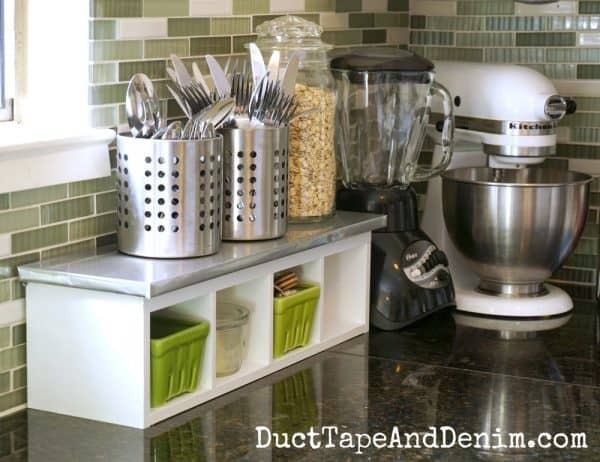 I love that the shelf is the perfect size for the kitchen counter! What a great find and makeover. Looks great and a lot of help in a small kitchen! I had no idea there was such a thing as stainless look contact paper! I have stainless appliances and will be on the lookout for a shelf like this to double deck on my small kitchen counter! I think you would have to assume whatever you put it on is going to be forever? Some of the new contact paper is removable, but on paint…for me, it usually takes the paint up with it. Maybe just put another piece on top surface only (not around the edges) if the surface starts to wear? Thanks!